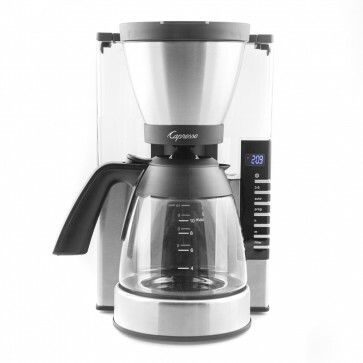 What are your must-have requirements for a drip coffee maker? Whatever they are, the MG900 likely has them in spades. Good water your thing? The MG900 has a charcoal-filtered 50-ounce removable reservoir, complete with 5-ounce cup lines on the side and a flip-out handle. Worried about extraction? the sub-7 minute brew time is right on the money (for volume) and the spray head is wide and saturates the grounds completely. What about temperature? The spray arm pulses out water at a nice and toasty 190 degrees. Want programmability? The MG900 offers settings for half-pot sizes, auto-on programming, and even tracks when you should change out the charcoal filter. Quick Brew - The MG900 can brew a full pot of coffee in just under 7 minutes. Half-batch - A dedicated 3-5 cup brew setting lets you brew smaller pots. Pause and Pour - A spring-loaded plug lets you pour your first cup without spilling coffee everywhere. Removable Water Tank - A quick flip and pull of the integrated handle is all you need to refill the back-mounted water tank. Water Filter - A replaceable charcoal filter helps soften water and improve the taste in the cup. Auto-on - Because sometimes, you need your coffee made for you. Metal Filter - Includes an optional metal mesh #4 cone filter (also works with regular paper filters). Glass Carafe Version - Looking for the stainless steel carafe version? Click here! Just Right - Not too hot and not too cold, the final brew temperature of the Capresso MG900 rivals Bonavita and Technivorm in-cup temperatures. Low Profile - Slim and tall, the MG900 is great looking and will fit in most kitchens. Hot Plate - The MG900's hot plate is much too hot, we clocked it at over 200 degrees. We recommend turning off the machine after it finishes brewing. Water Tank in the Back - You'll have to pull the MG900 out from under your cabinet to fill with water. When testing against other drip machines, we found an almost unanimous preference for paper-filtered baskets instead of metal. The MG900 takes the ubiquitous Melitta Cone #4 filter if you prefer it over the included metal one. While brew temp is notoriously difficult to test, a rough measurement (a probe thermometer wedged into the brew basket) registered a surprisingly consistent 190 degree brew temperature. We were more than happy with our results. The water reservoir is removable for a reason! Your coffee carafe is dirty and full of coffee oil, try not to fill the reservoir with it.